Natural from São Paulo, born in 1965, George Dobré is graduated in mechanical engineering, with extension course at Institut National des Sciences Appliquées (INSA) from Lyon, France. In 2006, after a business trip for Acre state, he decided to move to Rio Branco and ally his technical and market experience gotten at his family company to the extraction local communities. Then, Iiba Produtos Florestais Sustentáveis was born. 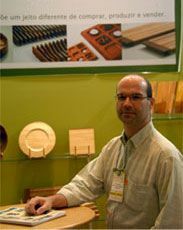 “Iiba Produtos Florestais Sustentáveis is the result of an accumulated experience gotten at my father’s company, established in 1970 at São Paulo state, manufacturing little wood objects”, says Dobré. “I was five years old when my father founded his company, and inside of it my passion for work with wood was born”, completes. Currently, besides drive the company, Dobré is a founding member of the Certified Forest Products Buyers Group, member of Social Responsability Council of the Acre State Industry Federation (Fieac) and director of the Union of Moblie Industry of Acre State (Sindimóveis).